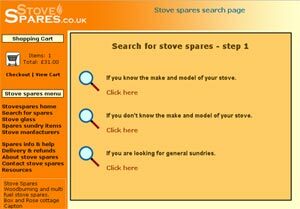 All our stove spare part enquiries are now handled through www.Stovespares.co.uk. 1 - Replacement stove glass is by far the most common spare part that we are asked for. So simply click the "stove glass" menu link and then select the make and model of your stove. 2 - Click "search for spares" if you want some other spare part. If you know the make and model of your stove then simply select the manufacturer and then the model from the dropdown boxes and the spare parts for that stove will be displayed. If you do not know the make and model of your stove then enter some details about your stove like it's size and the site will show you pictures of the stoves that match. 3 - Or simply click "stove manufacturers" and you will see a page with the various stove manufacturers and links to the spares for the stoves that they make. If you can't find the spare part you were looking for then you simply email Stovespares.co.uk with a description of what you need. But we can also supply a full range of stove spares from a door catch to a top plate for most stoves.